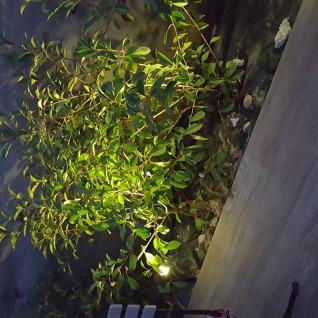 These LED spotlights are perfect for lighting up a home, highlighting a garden or flowerbed or marking a driveway and are self-contained and battery powered. This lets you place them where you want without worrying about electrical connection. These ecological and economical lights are charged with solar energy. They are equipped with a positionable solar panel on the front or back, to capture the sunlight. A second setting changes the light tilt, up or down. In addition, the waterproof ON/OFF button also adjusts the brightness (3 levels) and programs the strobe or SOS settings. According to the mode used, the battery of the spotlights last between 2.5 and 8 hours.The LED lights up at night and switches off automatically during the day. The floodlights can be fixed to a wall or planted in the garden. They are equipped with removable stakes, pins and screws.The polycrystalline photovoltaic panel has a large surface area in order to store solar energy and efficiently charge the 2000 mAh lithium battery. It only needs 8 hours for a full charge depending on the brightness of the sunlight and the position of the panel. The battery charges even when the device is turned off.The shells of the spotlights are black moulded (ABS) plastic. This material is resistant to shock, temperature changes and UV and ensures the modules are sealed. The lamp is designed to meet standard IP65 and is water and dust resistant. It withstands showers and splashes, but it is not fully waterproof. Luminous capacity: 960lm (Lumens) max. This model is available in cool white (6000-6500K) or warm white (yellow- 2800-3200K).You can find other Alice's Garden models in our online catalogue.